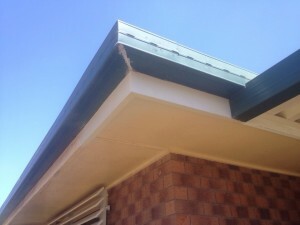 Timber fascia replacements and repairs are often performed as part of a gutter replacement job. 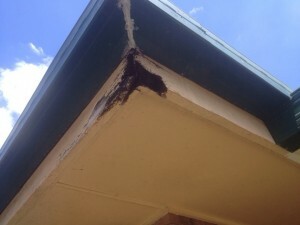 There are times though when timber fascias are in need of repairs even when the gutters are still in good condition. Often the best way to check fascias is through touching the timber and checking for softness. The reason you have to physically touch the timber is due to many occasions where the timber fascias will appear to be intact because the paint is making the appearance look ok. However upon closer inspection of your timber fascias you will find that the timbers have rotted and underneath the paint is quite soft. Timber fascia replacements are needed when the timber has reached a point that they are presenting a threat of falling down or when they are not doing a proper job of holding up your gutters. Timber fascia repairs can often be performed when the rot and deterioration on the timbers is more so at the ends of the fascia. Please see the photos below for examples. Timber fascia repairs are most easily performed on the ends of the timber. Where timber fascias can not be repaired they will need replacement. Painting timber fascias before the are installed is an absolute must. Fascia boards usually come pre primed so painting facia boards is usually a relatively easy process. On many occasions we have delivered timber fascias to home owners houses and our customers have opted to paint the timber fascias themselves. We are more than happy to allow this, as long as the owner understands that the timber fascias will need two coats of paint with appropriate dying time between the paint applications. Also, you must ensure that you are using the correct external paint. 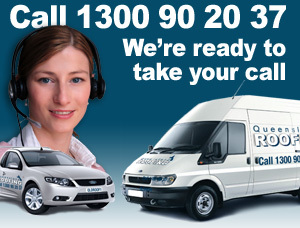 The team at Queensland Roofing are more that happy to guide you through the process, or you can simply as us to do the painting for you. For more a full free no obligation quote on your timber fascias call Queensland Roofing today and we can give you are risk free assessment.